Growing marijuana plants is one of the most exciting hobbies a person can adopt. It involves a lot of things happening at once, physical work, and pushes a grower to think outside the box. Fascinating things happen to people who grow on their second or third try, most of the time, they try to innovate common methods and even conform to what is available within the household to lessen growing costs. Simo78 wanted to hide his garden from prying eyes. When the attempts to conceal the plants failed, he conceded and grew hydroponically instead. This grow journal chronicles the adventure that Simo78 had from the moment he attempted to build a hidden garden to harvesting buds. Praised not only for surviving the war on drugs in the USA during the 1980s, Big Bud live up to expectations by delivering high yields. Along with that, this indica strain creates large buds with few leaves, which lessens labor for their growers. Smoking its buds bring about an earthy yet spicy aroma that serves a long lasting deep relaxation effects. Another indica strain lives up to its name, and that is the Super Skunk. Like its animal counterpart, the aroma that this strain gives are exceptionally pungent, although this one surprises with a sweet taste. The dense and thick buds that this strain has provides a relaxing effect that reduces stress and body paints. Simo78 sets up a hidden garden for the Big Bud and AK-47 XTRM seeds. It is a little too late to begin an outdoor grow in the area where he is in. However, the midday sun shines directly for three hours per day on the garden’s location, and the grower believes that is enough for the growing journey. The first thing that the grower did is to tap into a back lawn irrigation system in the area which comes twice a week for 15 minutes. Then, a mixture of cow manure, coco peat, and perlite would nurture these seeds into their vegetative phase. Seeds successfully sprouted. Because they are all on a stretch, he was advised to separate them to prevent entangled roots by a fellow ILGM member. Three each of Big Bud and AK-47 XTRM are planted directly into the dirt. While the progress of both plants is considerably slow, Simo78 is still happy because these little ones are growing. Simo78 decided it is going to be hydroponics grow after all. For nutrients, the grower added Maxicrop Seaweed Solution and plain water in the tub yesterday. However, something in the winds must have changed and Simo78 switched to Hydro Veg solution pH’d to 6. The seedlings seem to love the solution in the tub. In just a matter of 4 days, they all grew beyond recognition. There is some discoloration on the leaves, but Simo78 does not seem to mind. The results are getting better each day. Which may be the reason why Simo78 purchased another flowering tent to begin flowering some of these precious ones as soon as possible. The new flowering tent arrived in the nick of time. All plants proliferate in the Hydro Veg solution quite well, and they would outgrow the tub in a couple of days. One Meizhi LED Grow Light 900-watts Full Spectrum serves as the lone light for the plants flowering in the new tent. The Big Bud and Super Skunk are the first to flower in this tent. Simo78 made some adjustments inside by making a ScrOG (Screen of Green) net inside. They appear to be satisfied with it. Within a few days of setting it up, the plants are near to filling all the holes. Their grower expects them to flourish more as he switches the lights to 12/12 starting today. Buds forming atop their cola sites are wonders to see. However, Simo78 noticed the lumens from Meizhi 900-watts LED are not evenly distributed. The plan, for now, is to slide the light from one side of the tent to the other to get an even coverage. Another change that happened: the girls are already taking in 1/4 strength of nutrients beginning today. It might be a little too strong since they are only a week in flowering, so the grower gave pH’d water to weaken them up a bit. The lights might be doing a fantastic job especially now that buds showed up. It excites Simo78 to see the Big Bud and Super Skunk colas grow taller each day. Lights still do not cover enough of the flowering tent’s area. As unconventional as it may seem, Simo78 manually moves the LED lights to the left and right of the tent every other day. For the last two days, it has been staying on the right side of the tent. Today, it shines on the plants on the left side. 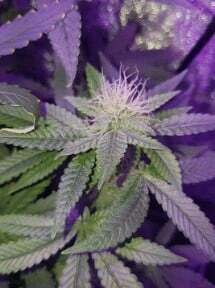 Only three weeks in flowering and white pistils are already dominating the buds. Simo78’s agenda for today involves clearing out lower branches of the plants under the net. Then, he would flush the nutrients out of the Big Bud and Super Skunk’s system. Once done, the grower would fill the reservoir with fresh nutrients. A mishap happened in the vegetation tent as the grower left the pump running which sipped the plants dry. Luckily the ones in the flowering tent are unharmed. On the other hand, they pack on the buds quite quickly. Expect more growth in the following days as the 300-watts LED in the vegetation tent now shines in the flowering tent. Transferring these lights might be the solution that Simo78 is looking for with regards to the problem with the lights. Although, it is not as powerful as the original 900-watts LED in the tent. As the lights turn off, Simo78 installed a dehumidifier in the flowering tent. Then, a drain goes straight into reservoir. Once the lights switch on, the buds show themselves covered with pistils and packed on the colas. Simo78 wanted the hidden garden to work so badly; he has spent a lot of time renovating the place. Now, the plants in the vegetation tent reside in the space. Sadly, Simo78 is too preoccupied with the remaining plants that he was not able to show what the buds look like in jars or after curing. Nonetheless, this reasonably new beginner has some buds to show for his hard work. Not that much, but there are still those that flowered later than the others that may bring more yield. This grow journal focused solely on the story of the Big Bud and Super Skunk. They are the first plants to go into the flowering tent and went under 12/12 light schedule. Being a hydroponic grow, it is prone to a lot of problems. However, it was a fairly smooth sail for these two strains, and not many obstacles happened. Although, that does not mean this grow does not have lessons to teach, because it does. Keep a dehumidifier/humidifier handy. Working with plants in water, the humidity can be quite unpredictable. These tools would make it easier to control and maintain the moisture in the growing space. Choose the reservoir nutrients wisely. Nutrients are the life and soul of plants grown hydroponically. Choose those that are not too harsh and are quite easy to balance with pH’d water. Hidden does not mean skimping on the expenses. Hiding marijuana plants from plain sight can be quite tedious. However, no matter how space and money saving that is, there are still a lot of things to consider. In the end, weigh the pros and cons of converting a space to a grow room, and grow tents.